Nagarkot Dhulikhel Namo Buddha Hiking is one of the best short trekking around Kathmandu Valley. This valley ringe tour is ideal for family hike with children. The hiking trail is filled with exotic forest and offers glamorous views of Himalayas and traditional hamlets. The hiking expedition takes you to the alluring hill station of Nagarkot and Dhulikhel to witness the magnificent views of the Himalayas. Nagarkot is an absolutely exquisite site that lies in Bhaktapur district and is about 30 Kilometers away from Kathmandu. Nagarkot is rather famous as a view point to view the stunning views of sunrise and sunset. 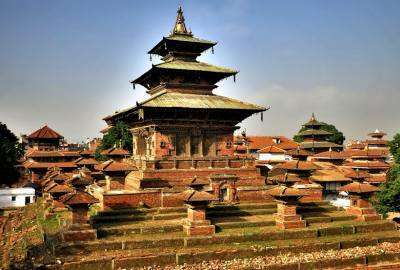 Towering at an elevation of 2195 meters, it is one of the most loved travel sites of Bhaktapur. Nagarkot offers superb views of Annapurna range, Manaslu range, Ganesh himal range, Langtang range, Jugal range, Rolwaling range, Everest range and Numbur range. Likewise, Dhulikhel is another popular tourist destination of Kavre District. Dhulikhel carries with it a majestic beauty of nature and numerous cultural and natural heritages. Dhulikhel offers finest panoramic views of snowcapped mountains and scenic landscapes. The mountains look like they are floating in the air when the blue haze covers the lower portion of the mountains. Dhulikhel is a paradise for tourists and nature lovers. The scenic view of beautiful mountains, hills filled with green vegetation, open landscapes etc make it a most admirable tourist destination. The different vantage point of Dhulikhel offers breathtaking view of Himalayas including Mt. Annapurna (8091 m), Mt. Ganesh Himal (7429 m), Mt. Langtang (7234 m), Mt. Phuribichyachu (6637 m), Mt. Gaurishanker (7134 m), Mt. Lhotse (8516 m) and many others. Wilderness Excursion’s Nagarkot to Dhulikhel and Trekking to spiritual Buddhist site of Namo Buddha starts with a drive to Nagarkot from where we begin our hiking next day. After overnight stay in Nagarkot then we follow the small walking trail just below the club Himalaya and continue towards to Rhonnie Bhanjyang. We can have a wonder Himalayan views from the ridge of Rhonnie Bhanjyang. We continue further through the rugged trail and continue towards Dhulikhel. We will pass through the village of Kankre and Tanchok and reach Tusal. From Tusal we will climb uphill to town of Opi. We hike further for some time and reach a beautiful hill of Dhulikhel. We will spend some time in Dhulikhel admiring the alluring Himalayan views from its ridge. We will soon walk/drive to Namo Buddha. Explore around this place of Buddhist spiritual site and place of peace and salvation. And overnight stay in a monastery and interact and eat together with monks. And third day we walk to Panauti, explore ancient town of Panauti and drive toward Kathmandu wrapping up our exotic hiking trip from Nagarkot to Dhulikhel Namo Buddha and Panauti. Day 01: Bhaktapur tour and Nagarkot. Day 03: Trek to Namo Buddha - Panauti and drive to Kathmandu. Day 01 :Bhaktapur tour and Nagarkot. After breakfast in Kathmandu, we drive to Bhaktapur; the ancient medieval old town is a treasure trove of unique Newari art and cultures while the latter showcases the natural splendor of Nepal. The ancient city of Bhaktapur or Bhadgaon (as it was known in the old days) is painted with bright colors of Newari culture and brushed with rich architectural wonders.Give us a day and we can show you a picture-perfect sunset over chain of Himalaya from Nagarkot that fascinate you with Nepal’s artistic wonders and tantalize you with scenic view. Day 02 :Trek to Dhulikhel After breakfast trek along the ridge of Nagarkot hill, and trail drops down the deep green valley to terraced rice field. Continue flat trail and eventually finds the Araniko high (Kathmandu/friendship Highway) Take short bus ride to Dhulikhel. Evening fantastic view of sunset and overnight at Hotel. Day 03 :Trek to Namo Buddha - Panauti and drive to Kathmandu. The trail proceeds through the unspoiled villages and almost no tourist. Eventually, after 5-6 hrs treks bring you to the one of most Buddhist sacred side of Namo Buddha with beautiful chorten and dGomps. If we have overnight stay in the Gompa and take immense pleasure of prying ceremony. Dinner with monk and practice meditation next morning before set out to trek is absolutely charm of the trip. After visiting Namo Buddha, we walk down to Panauti a small town located 32 km Southeast of Kathmandu, one of the oldest towns in Nepal, Panauti offers a poignant look at the passage of time. located at the sacred confluence of the Roshi Khola and Pungamati Khola, it is dotted with ancient temples. And later on we drive to Kathmandu. Transfer to you hotel by our guide from Wilderness Excursion. Necessary porters to carry your main luggage in required. Entrance fees of Sites in Kathmandu.